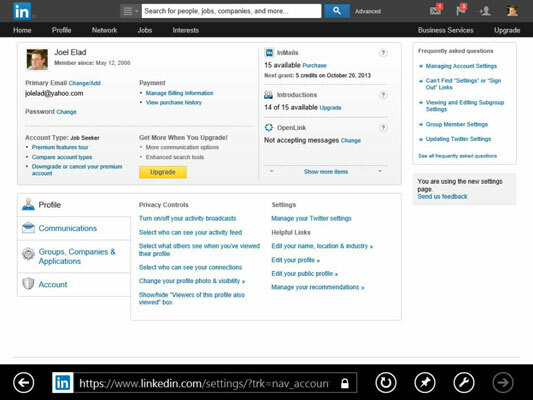 The LinkedIn home page is, by default, full of information about how you use the site. 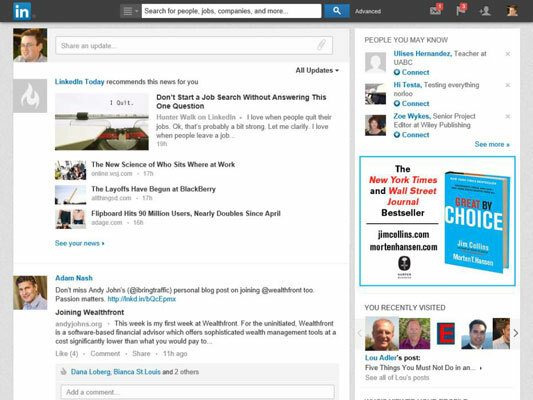 Think of the home page as your command console for working with LinkedIn. You can get to the home page at any time by clicking the LinkedIn logo or the Home link in the top-left corner of every LinkedIn web page. The home page holds a variety of information. Of course, your home page is unique to your LinkedIn identity, so it will look different from any other user on LinkedIn. And remember that your home page is based on the first-degree connections in your network, the pending messages in your Inbox, and the level of participation with functions, such as LinkedIn Groups or Recommendations, or applications like SlideShare or the Amazon Reading List. First off, check out the menu along the top of the site. This menu is referred to as the top navigation bar. This bar has all the major categories for checking your activities on LinkedIn. Just hover your mouse over each function to expand the menu item to see more options. The number of unanswered messages or invitations in your Inbox is shown in an orange box next to the Inbox menu option, along the top right of the page. Just hover your mouse over the Inbox link and click a category to go straight to the Inbox. To the right of the Inbox link is a notifications flag, and the number of new notification items is shown in an orange box next to that flag, similar to other social media sites such as Facebook. Scroll down your LinkedIn home page to see modules of other aspects of LinkedIn, such as LinkedIn Pulse, Jobs, and Network Activity. Based on your profile, positions, and whether you participate in functions like LinkedIn Groups, the site provides a default configuration for your home page and includes the modules it thinks are most useful to you. When you want to change any of the settings of your account, simply hover your mouse over your photo (in the top-right corner of the screen) and click the Review Privacy & Settings link to bring up your settings page.